Wesley Homes Des Moines brings the traveling ACT 1 Theatre Productions to its stage in The Terrace Auditorium with a Special Valentine's Evening bonus. 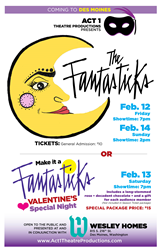 Wesley Homes Des Moines hosts three Valentine’s Day weekend performances of “The Fantasticks” by ACT 1 Theatre Productions on Friday, Saturday and Sunday, February 12 through 14. Show times and tickets for Friday and Sunday performances and the Special Valentine's Eve performance - complete with a long-stemmed rose, chocolate and a gift for each member of the audience - can be found at Brown Paper Tickets. “The Fantasticks” is a comical and romantic musical about a boy, a girl and their two parents who try to get them together by pretending to want to keep them apart. As originally written, the play cast the respective fathers as the conniving parents. ACT 1 Theatre Productions Director Petra Karr has chosen to instead put the mothers into the story, a change previous directors of the play have made. While the lines in the play have not been altered, the dynamics of the story with two women delivering the lines is different. Karr made the change, in part, in order to take advantage of the way in which the two actors she cast as the mothers interact. The narrator of the play, El Gallo, asks the audience to use their imagination and follow him into a world of moonlight and magic. The boy and the girl fall in love, grow apart and find their way back to each other after realizing the truth in El Gallo's words: "Without a hurt, the heart is hollow." “The Fantasicks” is the longest running off/on Broadway musical in history. The book and lyrics were written by Tom Jones and the music composed by Harvey Schmidt. ACT 1 is donating 100 tickets per Des Moines performance to Wesley Homes’ residents and encourages guests to purchase tickets early. Seating is limited. For additional show times and locations or to find out more about ACT 1, please visit their website. All proceeds go to ACT 1 Theatre Productions. With more than 50 combined years of regional and educational theatre experience under their belts, Christopher and Petra Karr officially launched ACT 1 Theatre Productions in 2008. In 2012, the theatre company became a non-profit organization. Though ACT 1 takes its act on the road, all of its major productions are done in the studio in Sumner, Washington.